SRINAGAR, 20th May 2015:The daughter of chief minister, and the PDP leader, Mehbooba Mufti, has supported advocating the passport to Gillani. It resulted the crack in the coalition Government of state on the issue of being given the passport to a separatist leader of Kashmir, Syed-Ali-Shah-Gillani. . The BJP leaders are adamant that Mr.Gillani may submit his apologise for the anti- Indian activities. PDP leader Mehbooba Mufti said that Mr. Gillani is an old man and he needs to go Jeddah to see his sick daughter, so there should not be any problem to issue the needful documents for his journey. 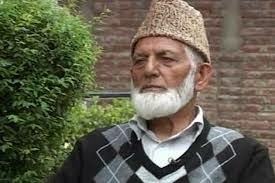 It is noticeable that Syed-Ali-Shah-Gillani, chief of Hurriyat Conference, has applied to issue a passport of India. It was informed that he wanted to go Saudi Arabia to see his sick daughter. Although the partner BJP of state Government of Jammu & Kashmir has strongly reacted on the issue and asked the separatist leader to apologise for his anti-Indian activities. The BJP spokes person, Khalid Jahangir, said for Gillani, ''What he did in last 25 years apologises his mistakes, he can be given the passport. The passport is only given to the Indian citizen, not for those who have no faith in the democracy of India."